Graduate students passionate about protecting the environment will have an opportunity to make that passion their profession and become Indiana’s environmental leaders of tomorrow as the result of a $100,000 gift from the McKinney Family Foundation to the Indiana University Lilly Family School of Philanthropy celebrating the school’s 30th anniversary. The gift counts toward the $2.5 billion campaign, For All: The Indiana University Bicentennial Campaign. Four students pursuing careers with nonprofit environmental organizations will be selected to be McKinney Family Philanthropic Fellows at the school. The gift will enable the fellows to earn a master’s degree in Philanthropic Studies and serve in graduate assistantships with Indiana environmental nonprofits for two years, learning first-hand how these organizations operate while also sharing new information and the latest best practices with the nonprofits where they work. The gift also will enable the McKinney Family Philanthropic Fellows to earn a Certificate in Fund Raising Management through The Fund Raising School at the Lilly Family School of Philanthropy. Grassroots and mid-size environmental organizations often face significant challenges to increasing their fundraising capacity. The training will prepare the fellows to help these nonprofits expand their ability to raise funds to support their mission. 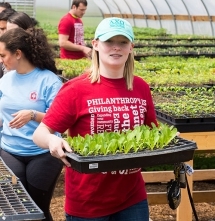 “We are honored to support the Lilly Family School of Philanthropy’s efforts to attract, train and empower outstanding nonprofit scholars and professionals who seek to advocate for environmental causes. We are confident that the McKinney Family Philanthropic Fellows will become the next generation of leaders in the environmental nonprofit sector,” said Marni McKinney, McKinney Family Foundation board president. Environmental organizations often have smaller budgets than many other nonprofits, and may not have the resources to send staff members to graduate school to hone their knowledge and leadership skills or provide them with professional development and training opportunities. By covering the cost of the fellows’ education and assistantships, the gift will enable the students to dedicate themselves fully to assisting environmental nonprofits and will allow those nonprofits to host a graduate student who will provide needed staffing and potentially become a future employee. People wishing to apply for the McKinney Family Philanthropic Fellowships should visit philanthropy.iupui.edu/MAscholarships. The deadline for applications is March 31, 2017. The fellowships complement previous contributions to improve and protect the environment made by the McKinney Family Foundation to Indiana University. Earlier this month, the foundation made a generous contribution to support the Indiana Sustainability Development Program (ISDP). A new workforce development pilot program to be administered by the IU Office of Sustainability, ISDP enables IU undergraduate and graduate students to gain real world experience through externships with a nonprofit, a government or a corporate sustainability project during the summer of 2017. Other funds include a fellowship connected with the McKinney School of Law and funded through the Conservation Law Center. Additionally, the Conservation Law Center provides legal counsel without charge to conservation organizations, works to improve conservation law and policy, and offers law students clinical experience in the practice of law and the profession's public service tradition. In December of 2011, the McKinneys made a landmark gift to name the Robert H. McKinney School of Law, one of the largest gifts in legal education. The McKinney Family Foundation believes environmental sustainability is the key to the future of Indiana. Therefore, the McKinney Family Foundation (MFF) is committed to building an environmentally sustainable future for every Hoosier. Through strategic partnerships, MFF advocates for environmental justice, seeks to conserve natural resources, and empower Indiana communities to live in a healthier, more prosperous, and more sustainable manner. For All: The Indiana University Bicentennial Campaign is taking place on all IU-administered campuses including IU Bloomington, Indiana University–Purdue University Indianapolis, IU East, IU Kokomo, IU Northwest, IU South Bend, and IU Southeast. The campaign will conclude in December 2019 to coincide with IU’s bicentennial year celebration in 2020. Founded in 1936, the Indiana University Foundation maximizes private support for Indiana University by fostering lifelong relationships with key stakeholders and providing advancement leadership and fundraising services for campuses and units across the university. Today, the IU Foundation oversees one of the largest public university endowments in the country, with a market value in excess of $1.9 billion. In fiscal year 2016, IU received $360.9 million in support from the private sector. IU is consistently ranked among the top four of Big Ten universities in annual voluntary support.